Life is good in Nevada City. Residents enjoy healthy small town living, greeting each other on the street and doing business with a smile and handshake. Business people, families and retirees continue to discover and pursue the Nevada City lifestyle. Here in the green hills of the Northern Sierra, you’ll find a range of arts and cultural opportunities, abundant outdoor recreation and some of the very best schools in the state, including the Nevada County campus of Sierra College. Above all, the friendly and welcoming attitude of our residents and entire community are cited as reasons why people want to settle and enjoy life here. A place “Where the Past is Always Present,” Nevada City’s entire 90-building downtown historic district is listed on the National Register of Historic Places. Residents and civic leaders place a very high priority on the preservation of Nevada City’s architectural heritage. Any new buildings and all restorations must be completed under strict architectural guidelines. A brochure, The Nevada City Walking Tour, available at the Chamber of Commerce and from local merchants, offers highlights of the downtown area’s past and present. Explore the narrow streets amid Gold Rush and Victorian-era brick, stone and wood buildings, enjoy the warm glow of real gas street lights and step back into the Nevada City experience. Local shoppers can choose between historic downtown Nevada City and the 7 Hills Business District just a half-mile south. Anchored by the large SPD Supermarket, the 7 Hills Business District offers a wide range of retail shopping, restaurants, a brewery, a bakery, health club, nursery and numerous local service businesses. Nevada City, like Rome, is built upon seven hills, giving the local merchants a strong geographic identity. 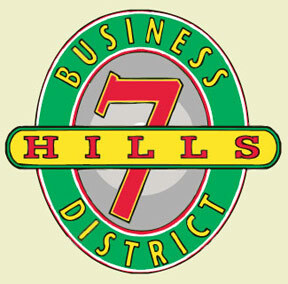 The 7 Hills Business District is located along Zion Street to Gold Flat Road, taking in Argall Way, Searls Avenue, Lower Grass Valley Road and the area across the freeway, including Prospector’s Nursery. Easy access is via the Gold Flat Road off-ramp from the Golden Center Freeway.